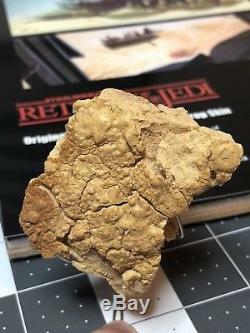 This is an original piece of Sarlacc skin that was used on set during the filming of the iconic Jabba the Hutt sail barge scene in Return of the Jedi. 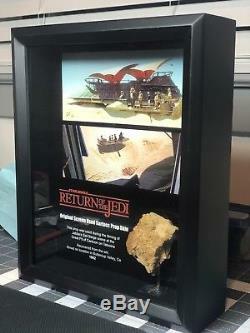 The Sarlacc prop comes displayed in an 8x10 frame with a custom build wire stand to hold the prop. A copy of the letter of authenticity will be included that was given to me with the Sarlacc prop. Please see photos for details. After filming for the Jabba Sail Barge scenes wrapped, the barge and Sarlacc props were destroyed and buried in the desert where they were filmed. This piece was recovered from the original filming location, Buttercup Valley near Yuma, AZ. 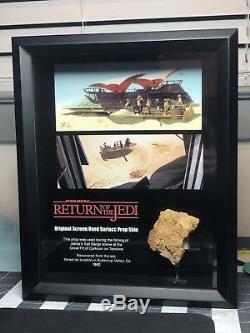 This is a great way to bring home an original piece of Star Wars history, ready to display! If you have any questions please dont hesitate to ask! The item "Star Wars ROTJ Sarlacc Skin Prop (Large Piece) Framed Return Of The Jedi" is in sale since Friday, August 31, 2018. This item is in the category "Entertainment Memorabilia\Movie Memorabilia\Props\Originals". 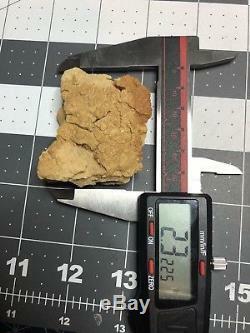 The seller is "joez2391" and is located in Fort Lauderdale, Florida.